The HTC One E9+ has the largest QHD display in the company's lineup at 5.5 inches (certain apps report it at 5.46 inches, but we're fine with calling it 5.5). At this diagonal 1,440 x 2,560px translate into 534ppi, which is crazy sharp, though the smaller 5.2-inch QHD panels on the One M9+ and One ME will obviously boast an even higher ppi. The display has great viewing angles and delivers spot-on colors, though its rendition is somewhat different from the One M9's. If anything, its colors are even more accurate, where the M9 has a slight greenish tint. Unlike other manufacturers, HTC doesn't give you the option to tweak the white balance to your liking, nor are there presets, but chances are you wouldn't want to anyway. Our microscope revealed a standard RGB pattern with equal numbers of red, green and blue subpixels. The display isn't overly bright at 100%, but for what it lacks in brightness it more than makes up in contrast. The deep blacks help for a stellar figure, which beats everything we've tested, except the Xperia Z1 Compact. At 50%, brightness actually drops to a little more than 40% of maximum. Mind you, with HTC's custom brightness toggle you can only set it precisely from within the menus. It does roughly correspond to the 2-bar position on the toggle. The HTC One E9+ is a decent performer in the sunlight legibility test, getting almost the same score as the One M9 before it. The HTC One E9+ comes with dual-SIM slots and each card supports quad-band 2G. Only one of those cards can benefit from the quad-band 3G and some 10 bands of 4G support, where Cat.4 is supported for download speeds of up to a theoretical maximum of 150Mbps. There's a GPS receiver with A-GPS and GLONASS and Beidou support for even more accurate positioning across the globe. Local connectivity features include Wi-Fi 802.11 a/b/g/n/ac (both 2.4GHz and 5GHz bands) with DLNA and Wi-Fi Hotspot. The HTC Connect feature works over the DLNA protocol to provide smoother integration of your phone to your home-entertainment setup, with supported devices of course. Those include multi-room speakers adhering to the Qualcomm AllPlay standard; DLNA and Miracast-compatible devices, Bluetooth speakers, as well as HTC-certified devices carrying the HTC Connect logo. Bluetooth 4.1 is on board, which sorts LTE interference issues. Version 4.1 is said to be more power-efficient and supports direct communication between connected peripherals, keeping your smartphone out of it. There's also NFC support. An MHL-enabled micro-USB 2.0 port sits on the bottom of the phone with USB host, for connecting external storage or wired peripherals. A standard 3.5mm headphone jack on top lets you plug in your headphones of choice. The One E9+ accepts nano-SIM cards. The microSD slot lets you extend the 32GB of built-in storage to up to 2TB, although we are yet to see such a monstrous card in the real world. The HTC One E9+ comes with a 2,800mAh battery, which is not user replaceable. We had our reservations before we kicked off our battery test routine, because the battery capacity is actually smaller than what the M9 has, and the E9+ has both a larger screen area to light up as well as much more pixels. That said, the One E9+ is powered by an entirely different chipset, and the Snapdragon 810 inside the M9 isn't exactly famous for its efficiency, so there was still hope. In the end, although the One E9+ is no miracle worker, it managed well with what it's got. That's not to say that we're happy with the 7 hours of video playback or the 8-hour web browsing record, on the contrary. 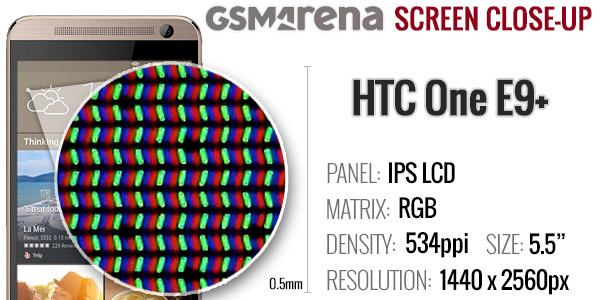 But credit must be given to HTC for actually squeezing more or less the same screen-on usage times out of the E9+ as it did from the M9, despite the increase in diagonal and resolution. The less than 12 hours of 3G talk times also don't stand very well with a high-end device, which is made to be used. Truth be told, there is an area in which the One E9+ does excel. With a single SIM card inside, the smartphone can remain in 3G standby for a little short of 14 days, which drops to about 12 and half days if you pop in a second SIM. Now, while that's half of the manufacturer's claims, it's still a respectable achievement in real usage terms. 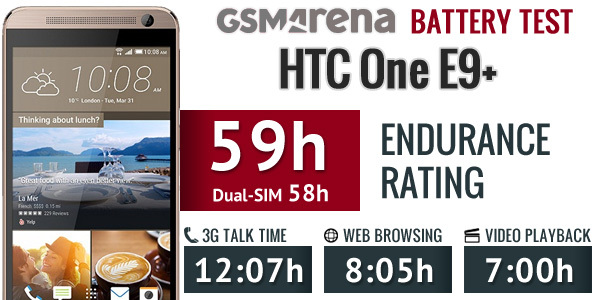 All of the above adds up to a decent but far from spectacular endurance rating of 58 hours (59h with a single SIM). What the number means is that under the hypothetical scenario that you use the One E9+ for an hour each of video playback, web browsing and voice calls per day, it'll last you for about two and a half days. It's worth noting that there's a variable which influences the standby times and, therefore, the overall endurance rating. BlinkFeed refreshes once every hour when connected to Wi-Fi. Depending on the number of sources you have selected that may mean up to a 30% hit in standby times, robbing the E9+ of the only admirable aspect of its battery life. However, that only results in a three-hour drop in the overall rating, so it's negligible in the grand scheme of things. Just bear in mind that if you absolutely must squeeze every minute of battery life, you'd better disable BlinkFeed.